H2 Designs: The Paper Players #104 - Wordsmith Happy Birthday! 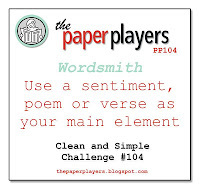 The Paper Players #104 - Wordsmith Happy Birthday! I've kept the layout really clean & simple, using only skinny mats & a single rhinestone to embellish my card. The sentiment panel is popped up on dimensionals. To get the tonal graduation in the stamping, I used the trusty stampamajig & four shades of blue ink. I alternated lines of stamping in a solid colour with lines of stamping that had the bottom half of the sentiment inked in the next darkest colour.